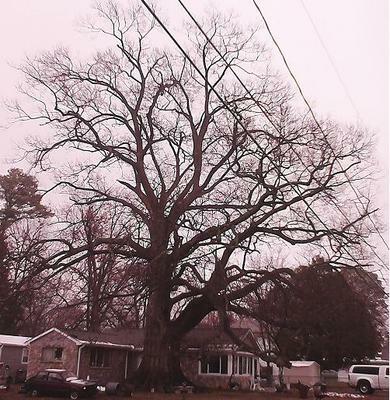 Colonial Beach has a history of HUGE trees! Cherrybark Oak. National co-champion 1993-2002: CBH 28’ 6”, ht. 110’, spr. 108’ (1992). 215 Ball Street, Colonial Beach. Black Oak. Dead. Former national champion 2001-2002: CBH 27’ 8”, ht. 108’, spr. 116’. Blown down in Hurricane Isabel, September 19, 2003. 512 Monroe Bay Avenue, Colonial Beach. ref. : Internet. Virginia Big Tree Program. Text & Photo. Comments: Although the American Forests photo suggests the tree was single trunked, the tree “split in two.” The Big Tree photo shows this tree was not single-trunked, but a double-trunked coppice, the abutting trunks dividing at ca. seven feet above grade. Katrina's Reply: That is certainly quite a tree! Here is a link with another picture of it. That's too bad about the tree on Monroe Bay that got knocked over by Hurricane Isabel.